I understand that missions pay out proportionally to the amount of materials you use, so of course crafting one single bullet is going to be a low payout. Nevertheless, I would expect the higher level missions to give *enticing* rewards. 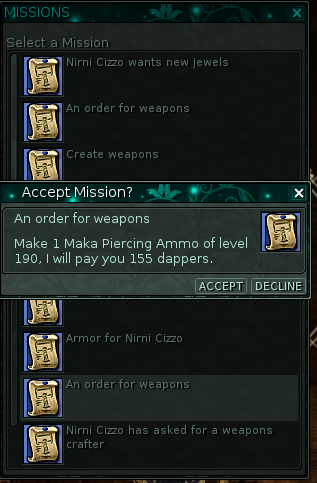 I don't expect all missions to give 50k+ dappers, but I really find a mission for 155 dappers to be insulting. 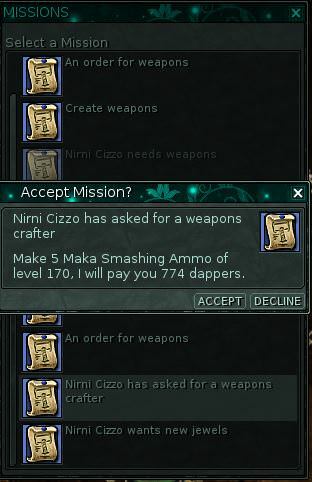 Please change these two missions so that either a) they out more dappers/material used, or b) they require larger deliveries (e.g. 100 bullets).